THREE days fishing with my family! The prospect deserved triple underlings in red on the calendar, as one of the year’s true highlights. Without my father and my older brother, David, I probably wouldn’t have taken up fishing as a youngster. And my nephew, Steven, has always been more like a younger brother to me, and so the chance of catching carp together was simply too good to be missed. My dad isn’t so keen to get onto the bank these days, and Steven couldn’t make the Tuesday date at “The Other Pool”, because of university commitments; and so David and I kicked off proceedings together, in glorious spring sunshine, while carp cruised before us in the bay. We remarked that they seemed a little “spooked”, although the farmer was later to inform us that nobody had fished the pool since last autumn. I set up behind a bush, while the chance for surface action remained, and then – crouching very low - I crept to the water’s edge. I saw two carpy mouths break the surface immediately below me, about six inches away from the side, and so I carefully lowered in a hunk of floating flake, and then awaited proceedings. A pair of lips cautiously enfolded the bread and I struck. I don’t think David could believe his eyes, seeing my old Dam carp rod take on a battle curve just ten minutes into the session. 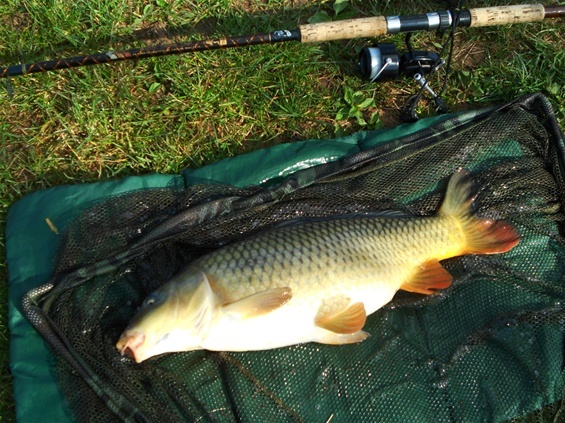 Soon enough, I had a plump common in the net, - a fish a little larger than the average for the pool. The problem was, the early action caused the rest of the carp to melt away, into lasting invisibility. One hour went by, and the wind changed direction, prompting David to move to the dam wall, where the wind was in his face. He was soon playing a common, a small one for the pool; but he was delighted with its condition and glad that his move had paid off. We had no further action that day, partly because heavy farm machinery was rumbling up and down the surrounding dirt tracks. It is very much a private, working farm, and so we would never dream of complaining. On Wednesday, David, Steven and I travelled to Shropshire to fish what I would call a well-established day ticket water – not without its litter problems, but scenic enough. It was hard going. David caught the first carp – two very small fish, on float-fished luncheon meat, and I upped the stakes a little by catching a very pretty fully-scaled mirror from a “jungle warfare” swim. I’d watched this fish for a while, and eventually tempted it on slow-sinking flake. The problem was, I had to play it out in a snag-infested hole, never yielding once inch of line and allowing my trusty AKN 116 to take all the lunges. David did the honours with the net, most efficiently, as the fish rolled before him. One hour on, Steven really raised the stakes when he struck into a nice double-figure mirror. He was only using 6lb line and the fish, at one point, sat “doggo” on the bottom, refusing to move. We wondered whether it had found a snag, but every time Steven bent his light carp rod to full curve, there would be a puff of mud, as the fish dug in! It was the strangest fight. He eventually put his rod on the rest, to await events, while the tip knocked and knocked. I was about to wander back to my jungle warfare swim when he yelled “it’s up”, and sure enough the float broke surface and the battle recommenced. Even then, it was a very strange fight, more akin to the endeavours of a hooked barbel. Round and round it went, always looking for a snag, or diving nose down towards the bottom. But finally it surfaced, and David did the honours with the big net. Steven’s arms were really aching by that time, and no wonder at it! 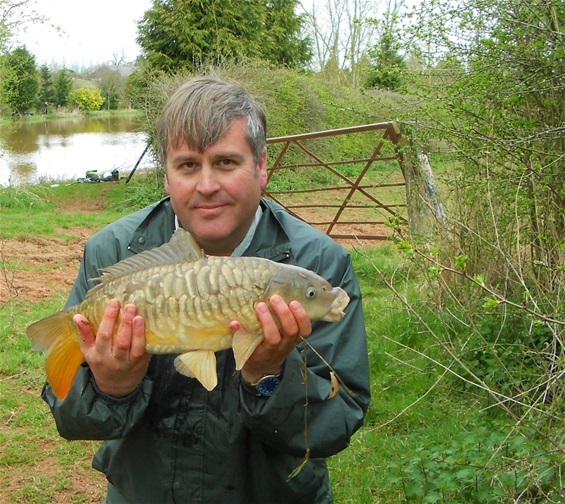 The following day, I took myself off to a tiny pond in a wood where, as a teenager, I once saw three or four nice carp. 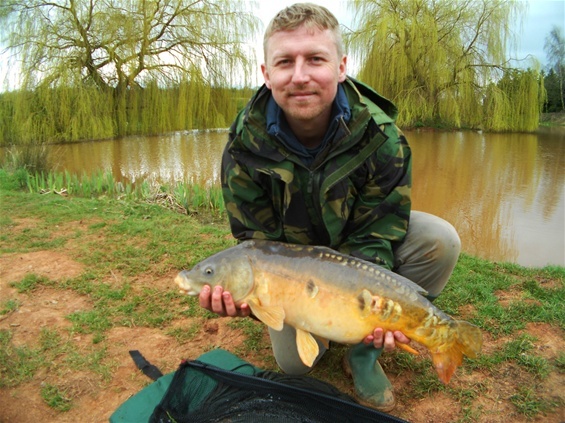 My bait was popped-up flake, and when the bob shot away I was certain that I had hooked a carp – but I hadn’t. It was a tench, and the best tench I’ve had for several years. I love surprises like that. On the evening, I fished a rural canal with David, after carp. 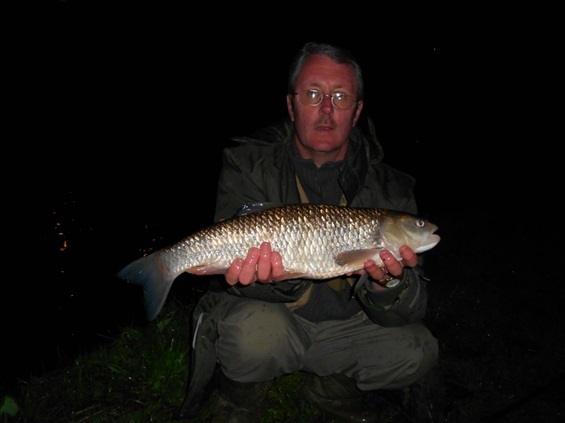 I missed one take, because I was dosing; but David connected with a fine canal chub – a personal best chub, as it happens, so we were very happy indeed with that result. No wonder we are a keen fishing family, with thrilling days like these. Picture above, - my nephew Steven and his hard-fighting mirror. My common from "The Other Pool". My fully-scaled mirror, caught through "jungle warfare..." Not big, but enormous fun to catch! 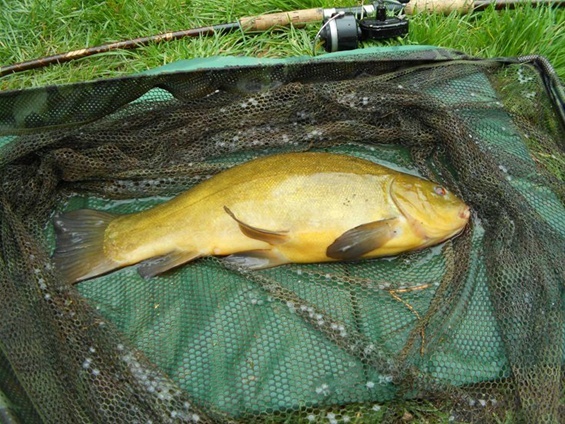 My tench, from the little woodland pool. A big, well-deserved canal chub for my brother, David. Yes indeed, David - most memorable. A lovely few days,no records breakers,but days to be savored and remembered not unlike a good port!